Produktinformationen "Healing Back Pain with Osteopathic Tension Releasing Exercises"
A functioning self-healing and immune system can solve virtually any health problem. Therefore osteopathy focuses on activating these oftentimes impaired self-healing powers and thereby achieve a completely natural healing. The cause of impaired self-healing powers is a problem with the nourishing and cleansing of the cells, the muscles, the bones or any other structure. The osteopath achieves this by means of his knowledge of human anatomy and physiology and with finesse of his palpation. The osteopathic techniques are however also wonderfully suited for self-treatment. This is where personal body-awareness comes into play. 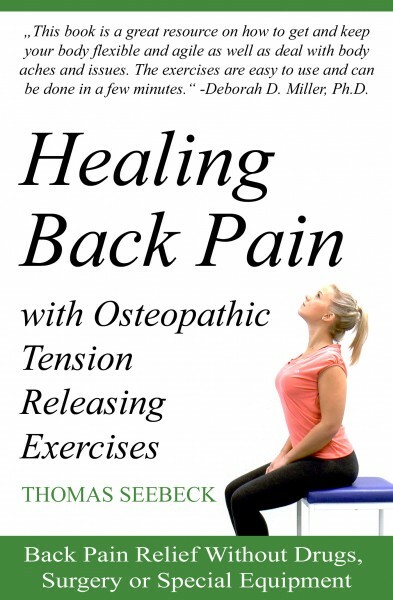 In this book, Thomas Seebeck conveys the principles of osteopathic treatment, and a variety of exercises for back pain relief at all areas of the spine. The exercises are illustrated in a detailed and practical manner. This book is a subset of the book “Osteopathic Self-Treatment” written by the same author. Weiterführende Links zu "Healing Back Pain with Osteopathic Tension Releasing Exercises"